so it will hang plumb when lifting 2 drums of different weight. 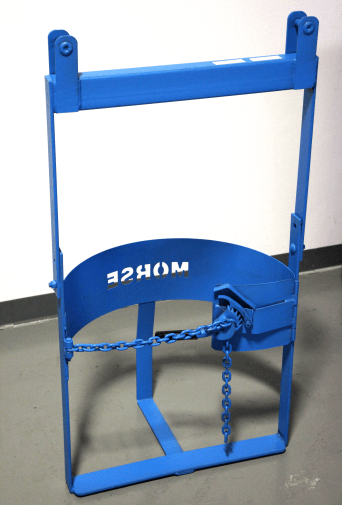 This custom 2-drum lifter has bottom support under each drum, a cinch chain around the drum, and no tilt function. 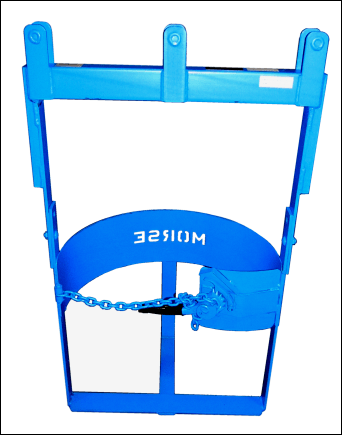 Use this below-the-hook barrel lifter to transport 1 or 2 drums in upright position. 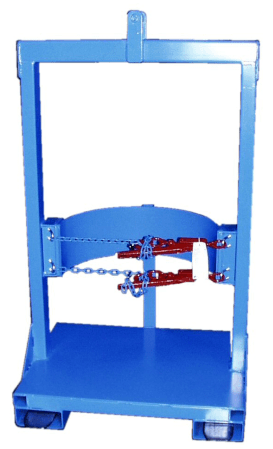 Drums are supported on a bar under the drum, and secured with a positive grip cinch chain and ratchet mechanism around the drum. Attach to your monorail, crane, or chain block. You may also attach to forklift using the Morse Fork Hook. Capacity: 2,000 Lb. (908 kg) total. 1,000 Lb. (454 kg) per drum. 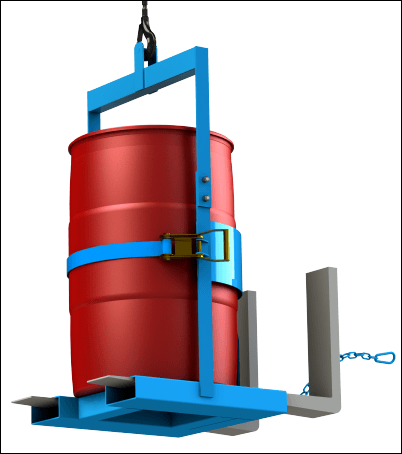 Drum lifter with 1,000 Lb. 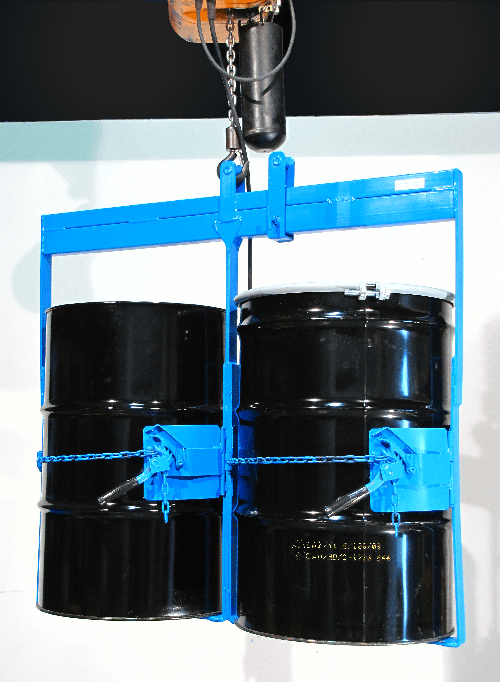 (454 kg) capacity has fork pockets under the drum so can it be transported with forklift, and a lifting eye on the top for use with your hoist or crane. with 2,000 Lb. 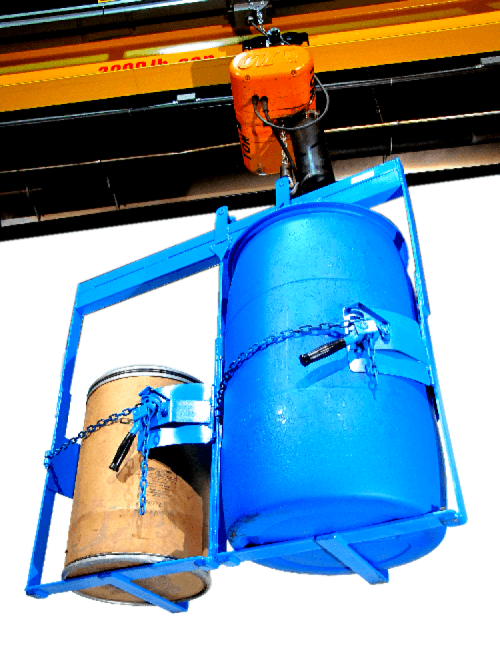 (907 kg) capacity has fork pockets under the drum and a lifting eye on the top. Question: How do you load a 2,000 Lb. (907 kg) drum onto a 2,000 Lb. drum lifter? for added stability and safety margin.